IF YOU like eating out, the chances are you’ll have a view on Jay Rayner, The Observer’s restaurant reviewer who waxes lyrical about (and puts the boot into) the top restaurants in the land. He’s also a judge on the TV show MasterChef and is now on tour offering his Ten (Food) Commandments. The original Ten Commandments have very little to offer when it comes to the complex business of how and what we eat, so Jay has decided that it’s time to act with a new set of hand-tooled commandments for this food-obsessed age. 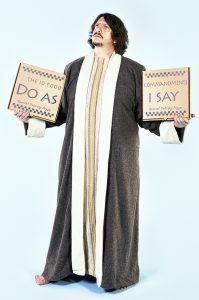 Jay Rayner brings The Ten (Food) Commandments to the Rhoda McGaw Theatre, Woking, on Thursday 15 March.